Grantmaking was down 20% in 2012, which was mostly due to a $21 million decline in support for higher education and $13.5 million decline in support for human services. The James F. and Marion L. Miller Foundation had the greatest impact on the education numbers: in 2010 it granted $27 million to colleges and universities, but discontinued funding commitments to higher education in 2012. several one-time capital grants to youth development in 2010 totaling $16 million drove the decrease in human services funding. Despite this overall decline, several funders increased their grantmaking in 2012. The Maybelle Clark MacDonald Fund increased its giving by 216% ($11 million) and M.J. Murdock Charitable Trust by 34% ($3 million). 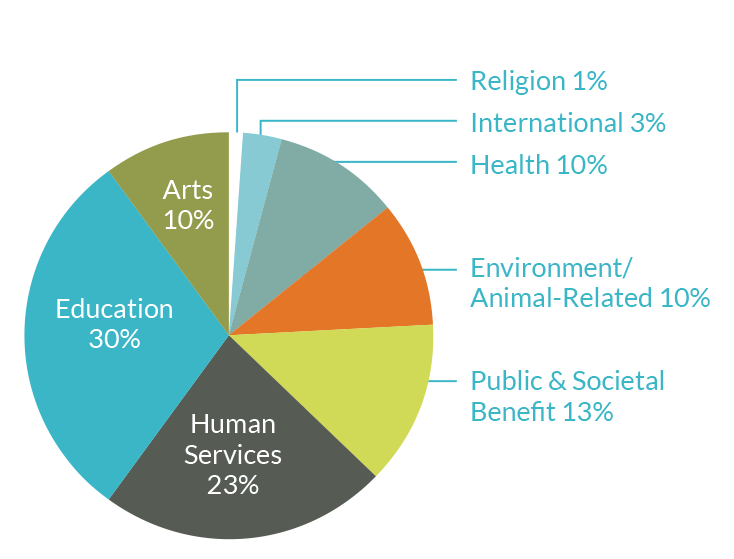 The environmental/animal-related sector was the only one to experience an increase in funding—17% ($2.6 million). Most of these gains benefited environmental and animal-related advocacy, policy analysis, education and support services.